Finger puppets are ridiculously fun. When you see one, you can't help but put it on your finger, and the next thing you know you're talking in a funny voice and creating a whole silly world for the character that's on your fingertips. Crochet finger puppets are fun to make and fun to play with. If you've never crocheted a finger puppet before then it's definitely time to try it, and here are the patterns that you need to do so. This free finger puppet crochet pattern by Cult of Crochet might be one of the easiest ones out there. 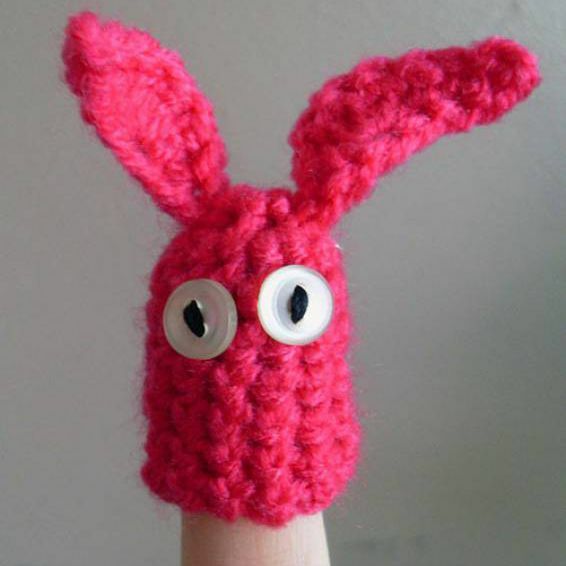 You crochet a simple finger cozy (which you could use as the basis for many different kinds of finger puppets) and then you add the bunny ears to easily turn it into an animal. Play around with different ears and eyes to come up with your own variation on this puppet. This is a free crochet pattern by Tamara of Moogly, and this is not the only free finger puppet crochet pattern that Tamara offers. She has patterns for lions, zebras and more. You can make a little zoo of finger puppets using her cute free crochet patterns. More importantly, you can get a good general sense of how to make a basic crochet finger puppet by following her detailed instructions. Crochet designer Joyce Noverr offers this finger puppet crochet pattern as a free download on Ravelry. It's of a bee, and it's got a more complex body shape than the basic finger puppets, which can make it more fun for advanced crocheters to work on. The big eyes are a nice touch. CrochetBot3000 has created a whole menagerie of finger puppet animals offered as free crochet patterns. The body of each of these animals is the same, and then there are changes to make different head shapes for the tiger, elephant, lion and bear. The designer intentionally made them very simple so that they are easy for beginners, use very little yarn and can be quickly crafted. Make individual animals or make a whole set. Sock monkeys are cute in every form and they are a lot of fun to play with regardless of what age you are. The finger puppet variation of a sock monkey is no exception. If this is a classic toy that makes you a little bit nostalgic, whip one up for yourself right away. Bring your favorite fairy tales to life by making finger puppets out of the characters. You can begin by making Rapunzel. The yarn hair is fun on this one and will give you ideas about how to adapt yarn on other puppets. Although many finger puppets are designed to look like animals, they don't have to be animal-shaped. For example, these cute finger puppets are shaped like different kinds of people. It can be fun to tell stories about your day with your kids using finger puppets as the characters. Like with the Menagerie of Animals we saw, the bodies are the same on these and then different things make up the hair and other individual features. The designs offer some diversity and you can add more with your own changes. These puppets are made with really basic shapes. That makes them easy to crochet. Use them to help teach a little one the names of different shapes including the triangle and circle. Make them with or without the eyes. Most finger puppets are small and sit just on top of one finger, but you can crochet finger puppets that are larger. The finger is still what makes them move around, so it is not the same as a full sized hand puppet, but you get more of an impact from the design. This is also easier for some people to crochet since working with smaller yarn and stitches takes a little more practice. Finger puppets don't have to be a specific animal or type of person; they could just be a more abstract creature like we see with this set of wiggly finger puppets by Tricia McDonald. Once you get the hang of making these, you may be inspired to create your own original designs!